The hanging of Pendle Witches at Lancaster Castle depicted in a 17th-century woodcut. Ainsworth, William Harrison written by Stephen Carver, Fukui University, Japan. William Harrison Ainsworth born in Manchester, February 4. Enters the Manchester Free Grammar School. First appearance in print: The Rivals: a Serio-Comic Tragedy, published under the pseudonym "T. Hall" in the Pocket Magazine. Leaves the Grammar School. Begins the study of law. Dedicates his first book, pseudonymously published, to Lamb: The Maid's Revenge; and A Summer's Evening Tale; with Other Poems, "By Cheviot Ticheburn." 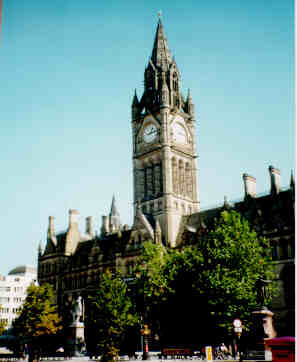 After the death of his father, leaves Manchester for London to study law. Admitted as a qualified solicitor. Publication of Sir John Chiverton (in collaboration with J. P. Aston). Marries Anne Frances ("Fanny") Ebers, October 11. Birth of his first child, Fanny. Birth of his second child, Emily. Having abandoned publishing, begins the practice of law. Birth of his third child, Anne Blanche. Begins his association with the new Fraser's Magazine. Death of his wife, Match 6. Jack Sheppard. In March, becomes editor of Bentley's Miscellany. The Tower of London; begins serial publication of Guy Fawkes. Guy Fawkes. Old Saint Paul's. In December, resigns editorship of Bentley's Miscellany. Inception of Ainsworth's Magazine, February. The Miser's Daughter. Begins serial publication of Windsor Castle. Saint James's. Begins serial publication of Auriol, under the title of Revelations of London. Purchases the New Monthly Magazine, in June. Serial publication of James the Second. James the Second. Serial publication of The Lancashire Witches. Begins publication in parts of The Life and Adventures of Mervyn Clitheroe. Serial publication of The Star-Chamber. Moves from London. Begins serial publication of The Flitch of Bacon. The Star-Chamber. The Flitch of Bacon. Purchases Bentley's Miscellany. Ainsworth's Magazine ceases publication. Begins serial publication of The Spendthrift. Ballads. The Combat of the Thirty. Begins serial publication of Ovingdean Grange. The Lord Mayor of London. Begins serial publication of Cardinal Pole. Cardinal Pole. Begins serial publication of John Law. John Law. Begins serial publication of The Spanish Match, as The House of Seven Chimneys. The Spanish Match. Auriol. Begins serial publication of The Constable de Bourbon. The Constable de Bourbon. Begins serial publication of Old Court. Old Court. Begins serial publication of Myddleton Pomfret. Myddleton Pomfret. Sells Bentley's Miscellany back to Bentley. Serial publication of The South-Sea Bubble. Serial publication of Hilary St. Ives. Hilary St. Ives. Serial publication of Talbot Harland. Resigns editorship of New Monthly Magazine. Tower Hill. The South-Sea Bubble. Talbot Harland. The Good Old Times; titled The Manchester Rebels of the Fatal '45 in subsequent editions. Merry England. Serial publication of The Goldsmiths Wife. The Goldsmiths Wife. Preston Fight. The Leaguer of Lathom. Chetwynd Calverley. Stanley Brereton. Honored at a banquet in the Manchester Town Hall, September 15. Dies at Reigate, January 3. Buried at Kensal Green Cemetery. The Introduction of The Lancashire Witches (1849) also takes place in the reign of Henry VIII, but the main action is set in the next century, when the curse delivered in 1537 by John Paslew, the last abbot of Whalley, against the infant daughter of his antagonist Nicholas Demdike works itself out. Mother Demdike is one of two notorious witches infesting a region of Lancashire; her daughter Elizabeth Device and Elizabeth's children, Jem and Jennet, follow in her evil footsteps. Alizon Device, who is supposed to be Elizabeth's daughter, is, by contrast sweet and pure; but she is actually the daughter of Alice Nutter, another witch. Alizon falls in love with Richard Assheton, scion of the chief family in the area, who returns her love. But the love and lives of the young couple are blighted by Mother Demdike's archrival, Mother Chattox. With the aid of Richard's cousin Nicholas Assheton and the ghost of Abbot Paslew (garbed as a Cistercian monk) the two chief witches, Mother Demdike and Mother Chattox, are finally burned to death; but not before they have worked a great deal of mischief. Both Richard and Alizon also die - Richard, as a result of the malevolence of Jennet; Alizon, in attempting to save her penitent mother from again falling into the Devil's power - and so does Alice Nutter, having abjured her evil ways. James I, who is regarded, because of his Demonology, as a great authority on witches, appears in the novel, and a great deal of Ainsworth's material is based on historical accounts of seventeenth-century witch hunts in Lancashire. In The Lancashire Witches, too, Ainsworth succeeds during most of the novel in keeping the narrative moving swiftly forward. When interest flags somewhat toward the end, it again does so partly because content and structure have ceased to have much connection with each other. An Introduction consisting of ten chapters, set in 1536-37, provides the background and the impetus of the main body of the story, which takes place early in the seventeenth century. During the prelude, John Paslew, the last abbot of Whalley, is martyred for participating in the so-called Pilgrimage of Grace against Henry VIII. A proud and passionate man, Paslew refuses to withdraw or soften the malediction which he hurls at wizard Demdike's daughter: "Thy child shall be a witch, and the mother of witches" (ch. ix). Indeed she will. By the time Book the First opens, three generations later, Mother Demdike bas reached the zenith of her might, which is rivaled only by that of her arch-foe, Mother Chattox. It is May Day - surely the strangest May Day in all literature. The crowning of Alizon Device as Queen of the May at Whalley is ordinary enough; but, in the course of the ensuing day and night, the simple rustic revels are counterpointed by wild supernatural carryings-on, culminating in a witches' sabbath in the ruined convent church. Amid this dazzling whirl of action, the romance between Alizon and young Richard Assheton (one of whose ancestors was deeply involved in Abbot Paslew's downfall) is set moving, and Alizon learns the secret of her parentage. The next day, which is treated in Book the Second, is hardly less crowded and exciting. The reader is given a vivid account of the power wielded by Mother Demdike and Mother Chattox; but, before this book ends, both of them die horribly. Shortly before being burned alive, Mother Demdike curses Richard and Alizon; and the reader, by now thoroughly attuned to the world of this novel, knows that their love can have no happy termination. More than two months elapse between the end of the second Book and the beginning of the third, and this break in the onward rush of the narrative helps to account for the anticlimactic quality of the last section. Everything of consequence has really been settled by this time: Richard and Alizon are clearly doomed; and, just as clearly, Mother Demdike's progeny will be hunted down with the aid of the wrathful Abbot Paslew's ghost. Matters are not greatly helped by the introduction of James I - deus ex machina, tyrant, and buffoon - speaking in Scottish dialect and playing to the hilt his role as the "British Solomon," expert on things-in-general and witchcraft in particular. (He reappears five years later, in much the same role, in Aisworth's The Star-Chamber) The pseudo-historical material involving the king - such as his dubbing a joint of Lancashire beef "Sir-Loin" - and conversations like that in which one of his courtiers delivers a textbook comparison-and-contrast between Shakespeare and Jonson - "great as Ben Jonson is, and for wit and learning no man surpasses him, he is not to be compared with Shakespeare, who for profound knowledge of nature, and of all the highest qualities of dramatic art, is unapproachable" (ch. vii) - help to slow the narrative and to weaken action and unity. Some of Ainsworth's inconsistent characters, it should be added in all fairness, are rather more effectively done than Catesby, Scarve, Micklegift, Bourbon, and Fairlie; in The Lancashire Witches, Nicholas Assheton, the Puritan squire who engages in some un-Puritanical diversions and who combines superstition and common sense in a remarkable way, comes off quite well as does, in the same novel, James I, who is by turns magnanimous and petty, royally stern and appealingly human. In the main, however, Ainsworth was unquestionably prone to take the easy way out in his characterizations, and lie was not above an occasional blunder. But it would be doing him an injustice simply to leave the matter at that. At his best, he was capable of bringing to his treatment of character the same sort of imaginative intensity which marked his handling of dramatic or visual scenes; and, even though he did not succeed in creating a whole gallery of unforgettable portraits, he certainly managed to fashion some compelling figures.